Here's a common problem ... we manage a business where customers have minimal long-term value. Scenario #1: 30% Rebuy Rate, $120 future spend per repurchaser, 60% gross margin, 15% pick/pack/ship expense, $8 of annual marketing expense. Profit = 0.30 * 120 * (0.60 - 0.15) - $8 = $8.20. Scenario #2: 30% Rebuy Rate, $120 future spend per repurchaser, 50% gross margin, 15% pick/pack/ship expense, $8 of annual marketing expense. Profit = 0.30 * 120 * (0.50 - 0.15) - $8 = $4.60. Scenario #3: 30% Rebuy Rate, $120 future spend per repurchaser, 40% gross margin, 15% pick/pack/ship expense, $8 of annual marketing expense. Profit = 0.30 * 120 * (0.40 - 0.15) - $8 = $1.00. 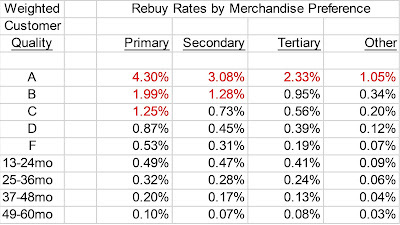 In a low rebuy rate environment with low annual spend per repurchaser, gross margin become critical to long-term value. Scenario #4: 20% Rebuy Rate, $500 future spend per repurchaser, 30% gross margin, 15% pick/pack/ship expense, $8 of annual marketing expense. Profit = 0.20 * 500 * (0.30 - 0.15) - $8 = $7.00. High future spend offsets low repurchase rates and low gross margin dollars. Scenario #5: 50% Rebuy Rate, $400 future spend per repurchaser, 25% gross margin, 15% pick/pack/ship expense, $8 of annual marketing expense. Profit = 0.50 * 400 * (0.25 - 0.15) - $8 = $12.00. When gross margins are low, you need high annual spend and high repurchase rates (think Amazon) for the long-term profit equation to work out well. Measure how all of your metrics interact. 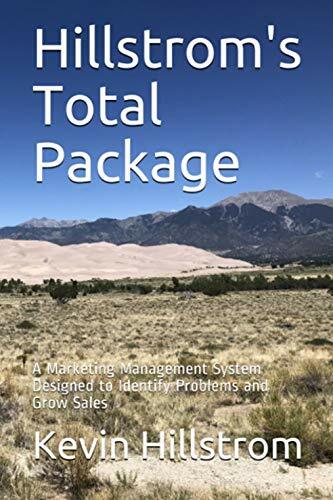 The interplay between repurchase rate, annual spend, and gross margin yields long-term value ... and ultimately determines whether you need a low-cost / no-cost customer acquisition program.